If a man could vote, he could also stand for election. 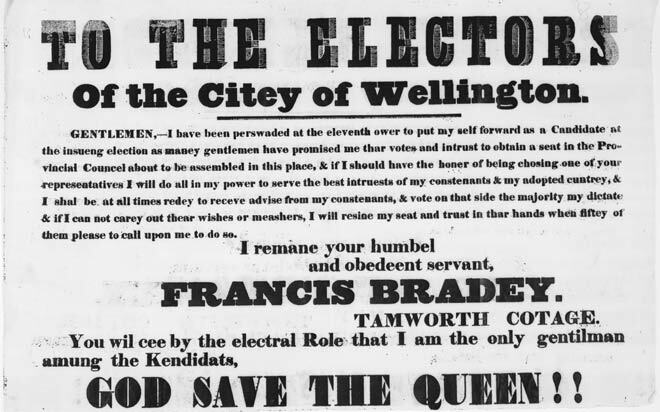 Francis Bradey, whose election handbill (littered with mis-spellings) is shown here, was a candidate in the 1853 Wellington city election. He was also active in Wellington provincial politics. The election was decided on a show of hands, with the number favouring Bradey 'meagre and small'. (Wellington Independent, 10 August, 1853, p. 2.) Fitzherbert, another of those who did badly in the show of hands, came forward and demanded a poll. A new poll was carried out some days later, in which Bradey was the lowest ranked (although Fitzherbert was elected).